Unique look and feel grew from specific design team objectives seeking to blend attractiveness with power. Look at Kawasaki’s all new NINJA® 650R sportbike and the first impression is one of pure design appreciation. Look a little longer and many of the innovative engine and chassis elements begin to come into play. But the entire package doesn’t truly project its intended engineering outcome until the motorcycle is viewed with a rider seemingly melded into its unique posture. Because the 650R was meant to have broad rider appeal, Kawasaki’s development team began its task with the rider—not the motorcycle. Focusing on all kinds of riders, and all kinds of riding, Kawasaki carefully studied the interface between human and machine. Riding positions were studied to discover which instilled the most confidence. Narrowing the distance between foot pegs and striving for a lower seat height and low effort controls all played into the design efforts. Ultimately, this exceptionally well-proportioned NINJA 650R represents a genre of motorcycling new to Kawasaki—one that finds itself at home with both novices and experienced riders, and one that will be seen equally in daily midtown commuting situations as well as week-end highway getaways. A combination of versatility, performance and style, this motorcycle knows no boundaries in terms of rider appeal. It will be a first-time purchase for some, a second or third motorcycle for others, and for all, it will be fun. Powered by a compact two cylinder engine mounted in a sleek, lightweight chassis, this extremely maneuverable model will earn its rank as one of the most rider friendly units in today’s marketplace. The very compact liquid-cooled, DOHC, 8-valve 649cc Parallel Twin with fuel injection delivers a smooth responsiveness that is tuned for rider-friendly power characteristics—especially in the low and medium rpm ranges that will inspire confidence in new motorcyclists. 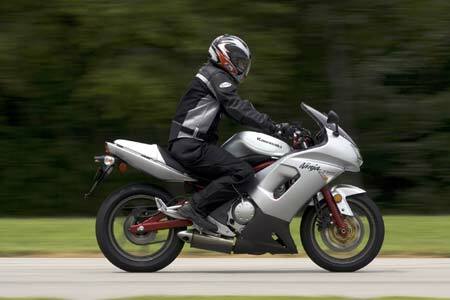 Its excellent mid-range characteristics will make the 650R a natural for medium speed commuting environments. And slipping in and out of traffic will be a cinch for this new entry, as its lightweight trellis frame and laydown shock also contribute to its overall compactness. While the powerplant on this new NINJA is compact, it is anything but minimal in its output. 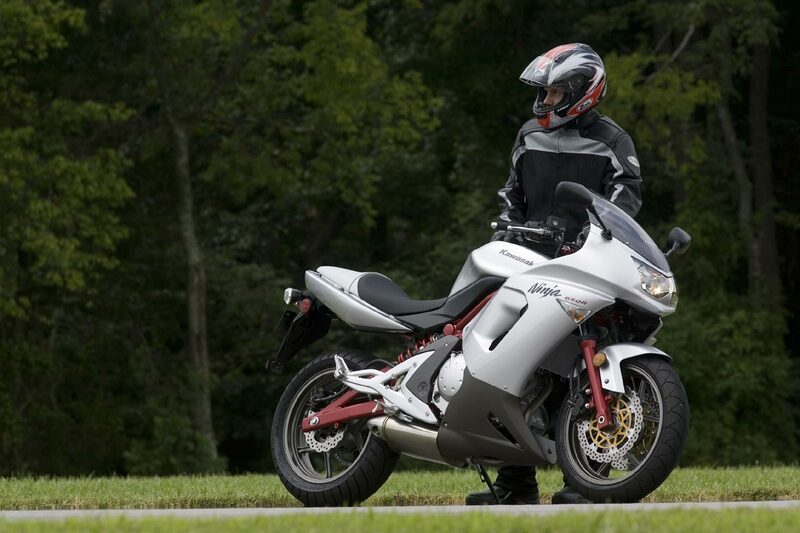 Just gauge the 650R’s roll-on response when making a highway pass and any concerns in that area quickly subside. 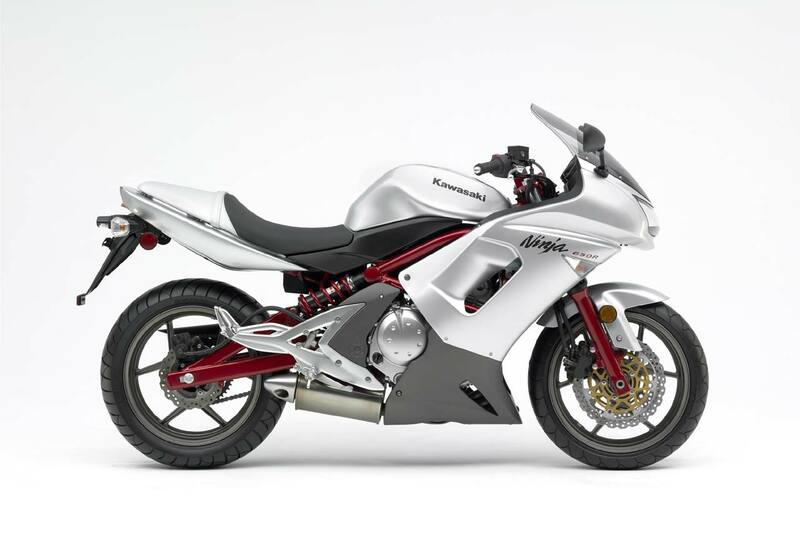 The engineers called on their vast experience building NINJA supersport machines to develop a motorcycle possessing performance characteristics that will be a match for anything currently available in the middleweight arena, including those with larger displacement. Bringing the motorcycle to a stop is handled by triple petal disc brakes that look as good as they perform. And the attractive six-spoke supersport-style wheels give the 650R a “light” look while reducing unsprung weight. This new entry sports a very aggressive headlight design, an aerodynamic windscreen and full fairing, and front turn signals integrated into the faring. The flowing bodywork includes a slim tail cowl with flush-surface tail lamp lens giving the new NINJA 650R a slim, agile appearance from the rear. Also contributing to the slim design appearance is a two-tone seat and a sculpted fuel tank. Instrumentation abounds with this multi-purpose motorcycle. A compact step-motor speedometer features an LCD display with digital readouts for odometer, twin tripmeter, and clock as well as an LED water temperature warning lamp. 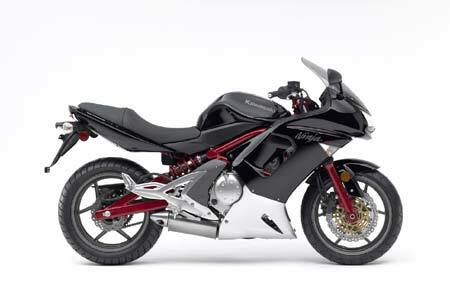 Few will look at or ride Kawasaki’s NINJA 650R and fail to come away impressed. Both from a design and a performance benchmark, the team responsible for this new motorcycle has accomplished their stated goal—creating a new category for Kawasaki where every rider, new, old, male, female, experienced or novice—can find a reason to park this one in the garage. Kawasaki Motors Corp., U.S.A. (KMC) markets and distributes Kawasaki motorcycles, ATVs, personal watercraft and utility vehicles through a network of more than 1,500 independent retailers, with an additional 8,400 retailers specializing in power products and general purpose engines. KMC and its affiliates employ nearly 2,400 people in the United States, with more than 450 of them located at the Irvine, California headquarters. Kawasaki’s tagline, “Let the good times roll.™”, is recognized worldwide and the brand has become synonymous with powerful, stylish motorcycles for over four decades. Information about Kawasaki’s complete line of recreational products and Kawasaki affiliates can be found on the Internet at www.kawasaki.com. – Parallel twin engine is the most compact in its category. The engine is considerably smaller than that of the Ninja 500 and helps reduce the dimension of the entire motorcycle. – Tuned to deliver smooth, responsive power in the low-to mid-rpm range with exceptional roll-on response for negotiating city traffic. – Triangular crank and transmission shaft layout makes the engine very short from front to back, a semi-dry sump oil system reduces overall engine height, while narrow pitch of the chrome composite plated aluminum cylinders helps reduce engine width. – Muffler with 3-way catalyzer and bullet-tip opening is mounted below the engine to help lower the center of gravity and aid weight centralization. – 180-degree crankshaft plus balancer shaft for extremely smooth engine operation. – Oil jets connecting rod big ends spray oil on the undersides of the pistons to aid cooling. – Maintains consistent engine temperatures for long engine life and sustained power during hard use. – Allows closer engine tolerances for more horsepower. – Coolant is routed through the engine cases to reduce external hoses. – 38mm Keihin throttle bodies feature sub-throttle valves for optimum performance and rideablity. The sub-throttles, located behind the main throttle valves, are controlled by the ECU so that the EFI system has more precise throttle response, similar to a constant-velocity carburetor. – Precise fuel injection plus exhaust catalyzer significantly reduce emissions. – Automatic fast idle system makes starting and warm-up easy. – Microprocessor-controlled timing never needs adjustment and is ultra-responsive to engine needs. – Spark plug mounted “stick” ignition coils are compact and help reduce weight. – Cassette-style transmission puts the transmission shafts and shifts into a compact layout that is easily removed as a single unit from the cases for easier maintenance. – High tensile steel trellis frame is small and light. – Designed using 3-dimensional computer analysis to achieve the optimum stiffness balance for better handling. – Narrow at the knees and feet for rider comfort and control. – Braced swingarm and offset, laydown single rear and shock complement the frame design to create an integrated line flowing from the steering head to the rear hub. 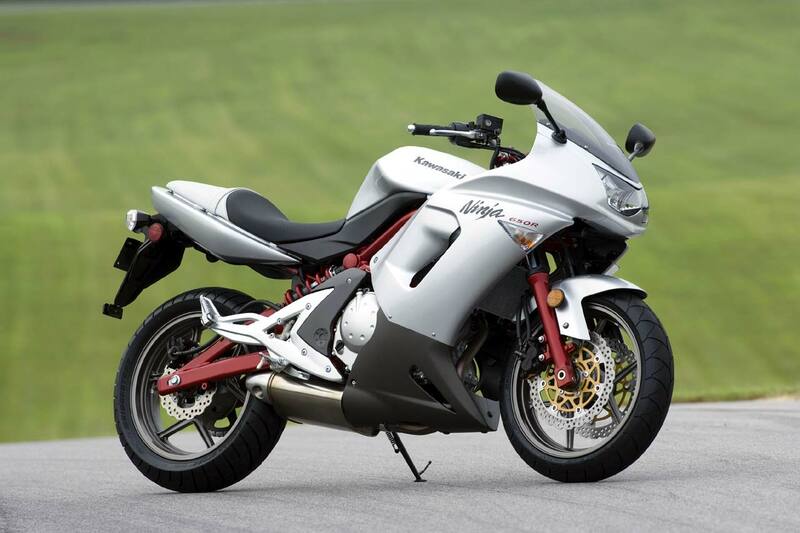 – Short, compact frame and engine design allows the swingarm to be longer, which helps improve overall handling. – Petal design offers improved cooling and warp resistance. – Same design found on the Ninja ZX-6R and ZX-10R supersports machines. – Also found on the ZX-6R and ZX-10R, the 6-spoke design requires much less material between spokes so that the rim thickness is thinner and overall wheel weight is reduced. – Low, narrow seat combined with the slim overall design allows riders to firmly plant both feet on the ground when stopped. – Carefully designed ergonomics result in a natural, comfortable riding position. 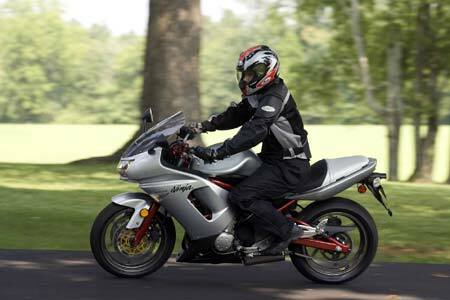 – Stylish full fairing with aerodynamic windscreen cuts through the wind and helps protect the rider. – Integrated front turn signals with clear lenses enhance appearance. Rear Wheel Travel: 4.9 in. * Price and specifications subject to change.